Homeowners who chose Crystal Fires Option 2 hole in the wall gas fire have a choice of a number of options so that this high efficiency gas fire suits their needs and nicely complements their existing décor. 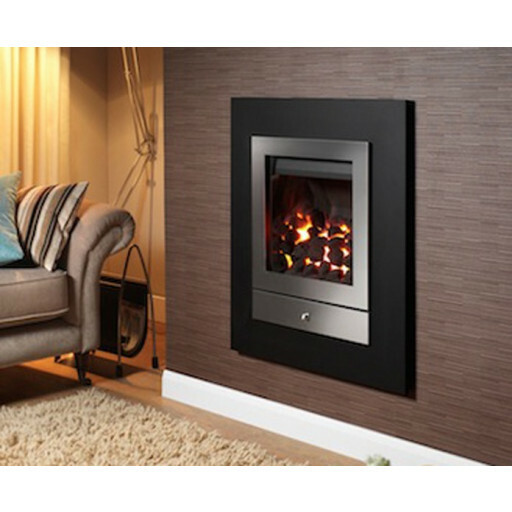 Crystal Fires Option 2 hole in the wall gas fire can be either open fronted or glass fronted, with a choice of either manual or remote control. The Crystal Fires Option 2 hole in the wall gas fire also comes with a choice of coals or pebbles for use with an open front, or driftwood for use when the glass fronted option is selected. The outer trim colour comes in a choice of brushed steel or chrome, with the backing colour in either cream or black. The Crystal Fires Option 2 hole in the wall gas fire is wall mounted, taking up very little space no matter where it is installed, and delivers a steady stream of up to 4.2kW of clean heat that is among the most energy efficient available. We wanted a good value hole in the wall fire as we only have a small living room,chose the option 1 fire which is perfect for us.